I got the router installed and working. Sharon and I are both on the internet at the same time. HOWEVER, we are still dumping Earthlink DSL and getting Verizon DSL at the end of the week. As I told you before Verizon is cheaper, the connection will be faster and the tech support is NOT in India. I hate having to say, “WHAT?” throughout a conversation to someone whose accent is hard to understand. American companies are getting off cheaper with off shore tech support, but they sure are not generating good will with their customers. Because I am changing ISP’s, I may not have normal internet connection from the 19th through the 22nd. I may have to rely on the cell phone connection. My Earthlink billing date is the 19th and Verizon is not supposed to be connected until the 22nd. This will be a minor inconvenience, but well worth it. I should go camping on the days I won’t have the DSL connection hooked up. OH, I can’t. I have to wait for UPS to deliver the new high speed modem. If we get that, it may pay to take off a couple days. We will solve two problems. 1. We will not have computer down time since we won’t be here. 2. We will get another camping trip in. The more I think about dumping Earthlink, the better it gets. Dump your ISP and go camping because you did. I love it. As you know I’m exercising and losing weight. 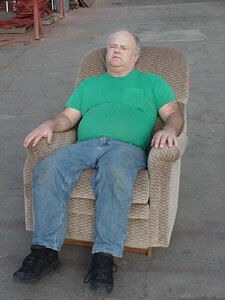 Well, I had a dream that I was in my recliner sleeping and………well, just take a look………. Of course you do know that you can combine those two pictures, or do you? I really need to start eating less and eating healthier. I think that dream could become a reality. I like the idea.